Where in the world is Terri? I had the privilege of attending the 2018 Training Conference in Atlanta, Georgia! What an exciting week! The time change wasn’t fun, but information was so worth it! My favorite takeaway was learning all the steps to creating an Escape Certification program. It’s going to be AWESOME! We will be presenting the details over the next few months, so stay tuned. I also brought back ideas for the October 2018 User Conference and ways to make training more interactive. On the left, the MC from Second City Works. On the right, Bob Harris, presenter of Living 'n Jeopardy. He is an author, TV writer, travel writer, and former comedian. Did you know that 2018 is the year for UNTRAINING? It's true! The theme for this year's conference was how to create new ideas for trainings and allowing customers to come up with ideas. Wow, how cool is that! So, my challenge to you is to send me an email with the training topics and ideas you have! Who knows?! 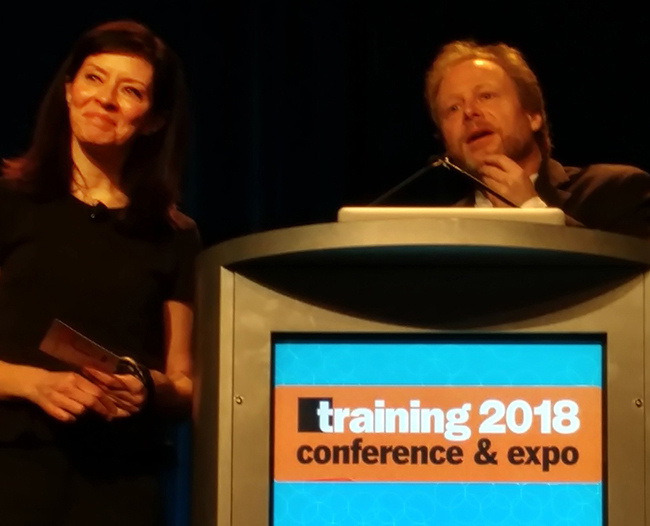 You might even win a prize and see your topic on the 2019 training schedule!